Huawei Y7 Prime (2019) with model number DUB-LX3 has passed FCC today. This model is known as Huawei Enjoy 9 in China. Huawei is ready to release a sequel to its Huawei Y7 Prime (2018). 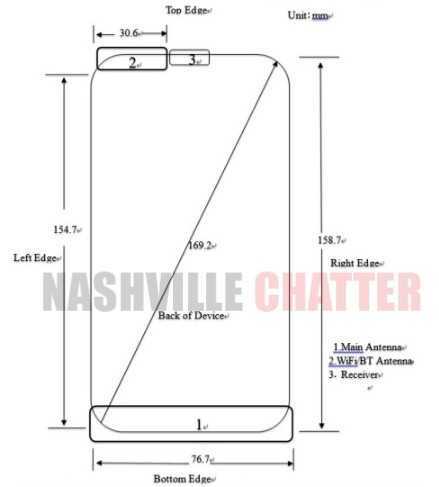 As per the FCC documents, the overall dimensions of this new Huawei device are 154.7 mm x 76.7 mm and the diagonal measurement can be seen to be 169.2 mm. The 2018 version of the Huawei Y7 Prime had a display just below 6 inches whereas the 2019 is expected to sport a 6.2″ display. The prototype image indicates that the phone will have its main antenna placed at the bottom of the front screen occupying the entire width of the phone which has aesthetically curved edges. There are 2 more slots on the top of the screen, one to accommodate the receiver or the speaker and the other to house the Wi-Fi antenna. There is no fingerprint sensor on the phone. DUB-LX3 is the global variant of the phone which is Y7 Prime (2019). The chinese variants bear the model numbers DUB-AL00, DUB-TL00 and DUB-AL20 which are known as Enjoy 9. Huawei has brought a lot of improvements over the last edition of the Huawei Y7 Prime 2018 in this 2019 edition. For starters, the processor has been upgraded from the Qualcomm Snapdragon 430 SoC to Snapdragon 450 SoC. The phone is expected to come in two variants namely 3 GB + 32 GB RAM and 4 GB + 64 GB RAM. There will be a slot for microSD card to take the storage to higher levels. The Android Oreo version 8.1 will be the OS which will have Huawei’s EMUI 8.2 version on top. The new Huawei smartphone is likely to sport 2 cameras in the rear, 13 MP + 2MP and a 8 MP front camera. The phone will have dual SIM capacity and a battery specs of 4000 mAh. This can be confirmed from the FCC listing of the phone which clearly indicates a 3900 mAh battery again confirming that the devices are one and the same. Huawei Enjoy 9 has a 6.26 inch capacitive touchscreen with a resolution of 720×1520 pixels. There is a microSD card slot which can help expand the memory up to 512 GB. and the phone has a waterdrop notch which houses the camera. Enjoy 9 comes in four attractive colors namely Magic Night Black, Aurora Purple, Coral Red and Aurora Blue. Huawei Enjoy 9 has already been certified in the chinese certification site CCC with charging specs of 10W (5V, 2A) which already provided a hint of this being a mid-range phone. This phone is priced 1499 RMB for the Chinese market which roughly translates to $215. The phone is expected to be released soon.